It must be great being Canadian. Instead of Greggs, they’ve got Tim Hortons. Instead of the cartoonist Matt, they’ve got Kate Beaton. Instead of an economy on the edge of a cliff edge and the prospect of mass chaos, they’ve got moose. And best of all, instead of a malfunctioning robot who veers between doing impressions of insurance-obsessed mongooses and Mussolini, they’ve got Justin Trudeau! 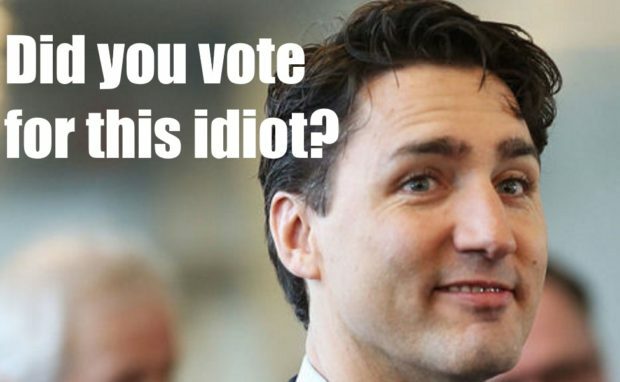 Perfect, beautiful Justin Trudeau, the woke Ken doll of the G8 – who last week apologised for eating a chocolate bar in the Canadian parliament! What a little scamp! While we have to deal with warring MPs and a failing democracy, the worst scandal the Canadians have to deal with is over a Twix! Oh, and a huge corruption case that threatens to bring down the prime minister, the government and one of the biggest contractors in the country. If you actually look at Canadian politics, and try to ignore the UK media’s perception of Justin Trudeau – they see him as a Calvin Klein model who’s pretty good at Sporcle quizzes – a darker picture emerges.